HTC just made the morning for many of its fans. You don't need to go to the cloud, the cloud can come to you, is HTC's logic for partnering with Dropbox, and they have good reasoning. Why spend on R&D, when there are numerous great cloud storage services out there you can just team up with? 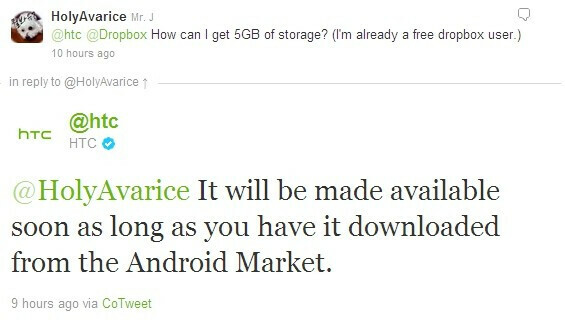 The Taiwanese announced via Twitter that they will be pairing 5GB of free storage with each HTC Android device, which is a more generous offer than the usual 2GB Dropbox gives to the freeriding subscribers, and equals HTC with storage offerings like iCloud, for example. The HTC Windows Phones don't need this for obvious reasons, since they already come with the 25GB free storage of SkyDrive. The smartphone and tablet maker already has the other cloud services covered via HTCSense.com and its video service HTC Watch, so now with the Dropbox partnership it adds storage as well, rounding up a complete cloud setup. 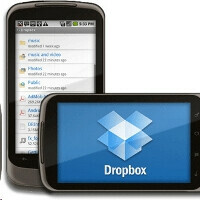 The Dropbox offer is for all HTC Android phones, young and old alike, the only thing you have to do is download the app from Android Market and enjoy the freebie. I'm on a Thunderbolt and I just downloaded and made an account. Still says I have 2 gigs of space left. Hopefully it will change to 5 soon. Lol not like it matters to me anyway as I've never used Dropbox before. I guess we'll just have to see.